Earlier this year (2007) I got a Canon S3is camera, before buying this I had a very basic point and shoot camera with no manual functions. After about 6 months with the S3is I had become a very keen amateur photographer, and very rarely looked at the “auto” functions ever again. Then after 1 year with the S3is, I felt constrained by some of the limitations… so I bought a Canon EOS 400D Kit II, bundled with the EFS 17-85mm IS USM lens. So having the luxury of having both of these devices, I would like to share the pros and cons of both. My time with my S3 taught me that it gives good results in outdoor, well lit area’s, but almost anything indoors is a problem. I attribute the lack of indoor performance on the S3 to it’s tiny image sensor. The S3 can take outstanding shots… as long as you manually set the ISO to 80 (100 at a push) and slow the shutter speed to compensate, and of course this only really works when the subject of your shot is static… anything that moves will cause blurring due to the longer exposure. Any ISO above 100 starts yielding very noisy results, and should only be used in an emergency. Lets talk a bit about that sensor… it’s small… it’s as small as the sensors in subcompact cameras!… but it’s small for a reason… that 12x Optical zoom you enjoy with the S3 is only possible in such a small lens assembly with this size sensor – but I will elaborate on this a bit later. What is important here is the bigger the sensor, the more light is “seen” by the camera, hence the reason why the S3 suffers in low lighting conditions. The sensor size of the S3 is 1/2.5″ (10.1mm in diameter), where the 400D’s sensor is 1.8″ (45.7mm in diameter).. quite a difference, and guess what… it shows! I’ve found that it is possible to get very usable results from the 400D at ISO400 (even 800 sometimes), and this is due to the fact that the sensor is so much bigger, the down side of this is that the lenses need to be much longer to get the equivalent focal lengths that the S3 is capable of. The S3 has got a fixed lens assembly which is small, but capable of fantastic range. The actual zoom range of the S3 is 6mm to 72mm, but you need to multiply those numbers by the crop factor, of 6x – so the 35mm equivalent focal range is 36mm to 432mm. I find the short focal length of 36mm equiv quite limiting and often wish for something with more wide angle. The aperture performance is pretty good on this lens, which allows maximum aperture of f/2.7 at the short focal lengths, and increasing to f/3.5 and the longer focal lengths. However the minimum aperture is rather disappointing, with a minimum of F/8… which is not great for landscape type shots where a deep depth of field is desired. The 400D’s EFS 17-85mm kit lens is heavy and rather large in comparison. The actual zoom of this one is 17mm to 85mm, but again this needs to be multiplied by the crop factor of 1.6x which equals a 35mm equivalent focal range of 27.2mm to 136mm. 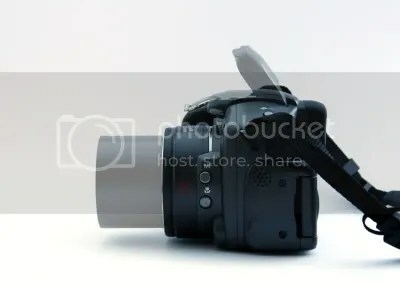 The speed of this lens is not that hot, the maximum aperture range is F4 to F5.6 on the short end, so to really take advantage of the low light capabilities of the larger sensor in the 400D you need a faster lens. 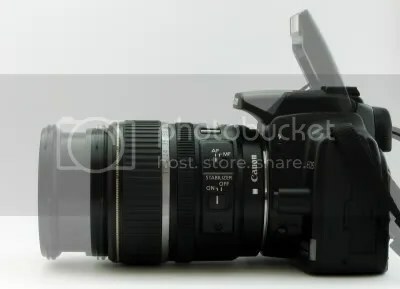 I plan to but the Canon 50mm f/1.8 lens which is pretty cheap, and will work well in low light conditions. The minimum aperture of this kit lens is nice and small, as are most DSLR lenses… so landscapes etc should not be a problem at all. I look forward to hearing the rest of the story. Also note the larger sensor allow you to raise the ISO, which lets you close the aperture to increase DOF. In the end, you don’t lose your depth of field compared to your previous camera.